A waitress in Arkansas claimed that half of a $300,000 winning lottery ticket her friend and co-worker scratched off belongs to her, but the friend has disappeared after claiming the prize, NBC affiliate KARK reported. The waitresses at Sportsmans Drive-In in Stuttgart all received lottery tickets from their boss the Friday before Christmas. "He told us whatever we won, it would be split between us for our Christmas bonus," said waitress Leslie Underwood. Underwood and fellow waitress, Mandy Vanhouten, have been friends for a decade. They scratched off their pile together at the bar. 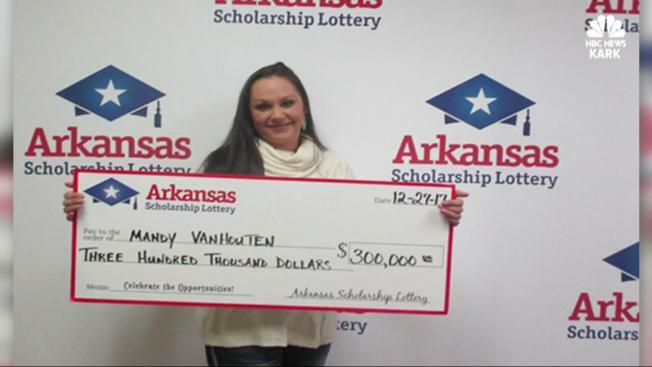 Vanhouten scratched off a $300,000 Fortune instant ticket, worth $10, and won the top prize. Since they work the same shift, she and Underwood would each get $150,000, according to the deal Underwood said their boss made. Underwood and Vanhouten were going to claim the money together in the new year, but Vanhouten decided to take it and run. Underwood, a mother of five, saw the picture of Vanhouten Wednesday with a check in her hands and a big smile on her face. "It's a little emotional," Underwood said as she started to cry. The two have been best friends for nearly a decade. "I helped her get the job, put in a good word, stuck my neck out for her, let her stay with me so she didn't have to drive back and forth," Underwood said. "I think that's what hurt me the most is as much as I've done, she could have done right for once." She hasn't heard from Vanhouten. KARK tried calling Vanhouten, got her voicemail and did not receive a call back. Vanhouten also never came into work for her shift this week. If she doesn't get her share of the winnings, Underwood said she plans to take legal action. However, Vanhouten is the only one who signed the back of the ticket.